Kate Swaffer was just 49 years old when she was diagnosed with a form of younger onset dementia. In this book, she offers an all-too-rare first-hand insight into that experience, sounding a clarion call for change in how we ensure a better quality of life for people with dementia. Kate describes vividly her experiences of living with dementia, exploring the effects of memory difficulties, loss of independence, leaving long-term employment, the impact on her teenage sons, and the enormous impact of the dementia diagnosis on her sense of self. Never shying away from difficult issues, she tackles head-on stigma, inadequacies in care and support, and the media's role in perpetuating myths about dementia, suggesting ways in which we can include and empower people with the diagnosis. She also reflects on the ways in which her writing and dementia advocacy work have taken her on a process of self-discovery and enabled her to develop a new and meaningful personal identity. Kate's powerful words will challenge misconceptions about dementia, and open our eyes to new ways of supporting people with the diagnosis. A must read for people with dementia and their families as well as for professionals and carers. Disclaimer. Foreword by Dr Richard Taylor. Foreword by Glenn Rees, AM. Foreword by Dr Shibley Rahman. Dedication. Acknowledgements. Author's Note. Introduction. 1. Why Me, Why This, Why Now? 2. The Early Days. 3. So, What the Hell Did Happen to My Brain? 4. Illness, Sadness and Positivity. 5. The Dementia Train and Not Sweating the Small Stuff. 6. Thank You, Richard Taylor. 7. Reactions to Dementia: Yours, Mine, Others'. 8. The Burden of Disbelief. 9. Being Diagnosed with Younger Onset Dementia. 10. Children of People with Younger Onset Dementia. 11. Early vs Delayed Diagnosis. 12. Dementia, Grief and Loss: It's Very Complicated. 13. The Emotional Toll of Letting Go. 14. Myths of Dementia. 15. Loneliness and Dementia. 16. Prescribed Disengagement (R). 17. Dementia as a DisAbility. 18. Stigma and Dementia. 19. The Language of Dementia. 20. Dementia and Word Finding. 21. Employment and Dementia. 22. Driving and Dementia. 23. Family Care Partners or BUBs (Back-Up Brains). 24. Care Partners Speaking Out Publicly About People with Dementia. 25. Guilt. 26. Who's Got the 'Challenging Behaviours'? 27. Dementia and Common Sense. 28. Interventions for Dementia. 29. Blogging and Writing as Interventions for Dementia. 30. Advocacy as an Intervention for Dementia. 31. Volunteering as an Intervention for Dementia. 32. Dementia-friendly/Accessible Communities. 33. Human Rights in Dementia and Aged Care. 34. There is Big Money in Dementia. 35. Nothing About us, Without Us... 36. Love, Gifts, Dementia and Dying. 37. A Final Word on Resilience and Memory. 38. Proof that People with Dementia Can Live Beyond and Diagnosis of Dementia. Dementia: A Brief Summary. Resources. References. Laura Venables, who works on the Society's Engagement and Participation programme, was fascinated by Kate's account of 'prescribed disengagement'. This is how Kate describes the advice she says she was given - but ignored - to withdraw from her life and work after she was diagnosed. Laura says, 'Kate challenges the assumptions that are continuously brought out to define living with dementia. 'She openly illustrates her experiences of striving to continue life as she lived it the day before she was diagnosed, and of all the opportunities that she has become involved with since diagnosis - it's exciting stuff!' -- Laura Venables * Alzheimer Society Book Group * Keith Oliver, a Society ambassador who has Alzheimer's, says the book covers areas that he hasn't seen written about in such personal and emotive ways elsewhere. He adds, 'The structure of short, crisp chapters works extremely well and gives the author the opportunity to structure her thinking and experience in a clear way.' -- Keith Oliver * Alzheimer Society Book Group * Janet Baylis, Manager of our Dementia Knowledge Centre, says, 'There are few books written by people with dementia. This is one that I would strongly recommend to anyone with a recent diagnosis who is searching for answers about living well with their condition.' -- Janet Baylis * Alzheimer Society Book Group * The scope of Kate's book is beyond that which anyone else with dementia has attempted. She reflects upon loneliness, guilt, driving, aged care, writing and advocacy. -- John Killick * Australian Journal of Dementia Care * Before being diagnosed with younger onset dementia, Kate Swaffer loved to study, to learn, to be of service to others. Now living with dementia, she has not changed in these respects whatsoever. 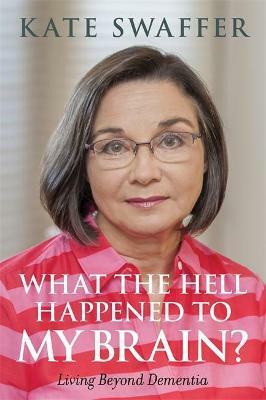 Her wonderfully illuminating book should be required reading for people and families living with dementia. -- Steven R. Sabat, Ph.D., Professor of Psychology, Georgetown University, Washington D.C., U.S.A.
Kate Swaffer commenced her professional career as a nurse specialising in dementia and aged care. Following her diagnosis of younger onset dementia, she completed a BA in Writing and Creative Communications, a Bachelor of Psychology and a MSc in Dementia Care at the University of Wollongong, Australia. She now works as an advocate and activist for dementia and aged care, has published many articles and a book of poetry and has presented nationally and internationally on dementia. In 2015, she was named Dementia Leader of the Year in the University of Stirling International Dementia Awards and Emerging Leader in Disability Awareness in the National Disability Awards, was winner of the Bethanie Education Medallion, and was a state finalist in the Australian of the Year Awards for 2016. She is Co-founder and Co-chair of Dementia Alliance International, a board member of Alzheimer's Disease International and is to become a member of the World Dementia Council in February 2016. She blogs at www.kateswaffer.com, tweets as @kateswaffer and can also be found on Facebook.